The safest and most efficient browser for internet marketers. MarketerBrowser is a browser software to help Internet marketers manage multiple accounts of the same website and do promotion safely and efficiently. You can open multiple pages and bind different proxies and useragents for pages so it will be safe even to run multiple accounts on one website. Accounts are independent of each other. Imagine the feeling of accessing all your accounts on one browser without always having to log out or opening private browsers for logins. Simply log in to each account on a different tab and they will all be independent of each other! DATA SUBMIT STORAGE AND RE-CHECK AUTOMATICALLY : MarketerBrowser can save the data like comment, link and image etc... you submitted to any site or page, then re-check them automatically to see if these data or links are still there and give you a clear report! This will save you big time to check your work as a seriously internet marketer. 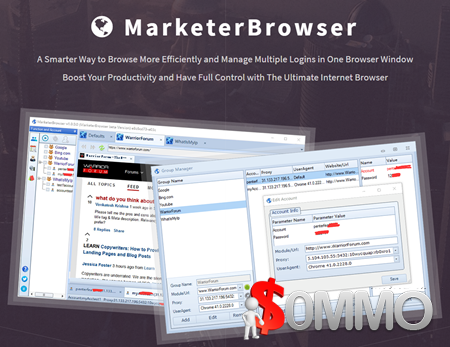 UNPARALLELED MULTI-LOGINS MANAGEMENT : MarketerBrowser gives you the power to visit and open an unlimited number of logins in different tabs on one window browser. With MarketerBrowser, you can log into multiple accounts on the same site simultaneously without using other browsers or incognito sessions. EFFECTIVE BINDING OF MULTI-PROXIES AND USER AGENTS : Wouldn’t it be awesome to have a browser lets you connect multiple proxies simultaneously? To ensure your maximum safety and create an enabling browsing environment, MarketerBrowser allows you to open multiple pages and assign a separate proxy and user agent to each page. TOP-NOTCH CLOUD STORAGE : This browser comes with a remarkable cloud storage solution! With MarketerBrowser, your data can be remotely maintained, managed, and backed up so that you can work from anywhere and securely access your work from any device. BROWSING HISTORY MANAGEMENT : MarketerBrowser lets you manage your Internet browsing experience more efficiently by saving your browsing histories, allowing you to access them fast each time you log into your browser. ADVANCED BROWSER AUTOMATION : You don’t have to perform repetitive tasks over and over again. MarketerBrowser allows you to customize your browsing operations and set your sites and accounts to browse or login automatically with a simple tap of the button, saving you time. CUTTING-EDGE ANTI-FINGERPRINT TECHNOLOGY : MarketerBrowser is designed to offer you a state-of-the-art defense against browser fingerprinting. With this browser, you are protected from any system that can identify or track your activities online. Please feel free to post your get MarketerBrowser 1.12 Ultimate Download, blackhat, free download, tutorials, review, patch, cracked, hacked, Serial, keygen, nulled, WSO, nulled script, nulled plugin, link list, torrent, NFO,4Shared, Amazon Drive, amazon s3, blackhat, Box.com, copy.com, dailyuploads, DepositFiles, Dropbox, Google Drive, iCloud, iDrive, JVZoo, Koofr, mediafire, Mega, mirrorcreator, mirrored, NextCloud, NitroFlare, OneDrive, OpenDrive, Openload, pCloud, rapidgator, review, sendit sendspace, SpiderOak, SugarSync, Sync.com, Tresorit, uploadboy, uploaded, ul.to, WeTransfer, WSO, Yandex, Zippyshare, direct links, requirements or whatever-related comments here.